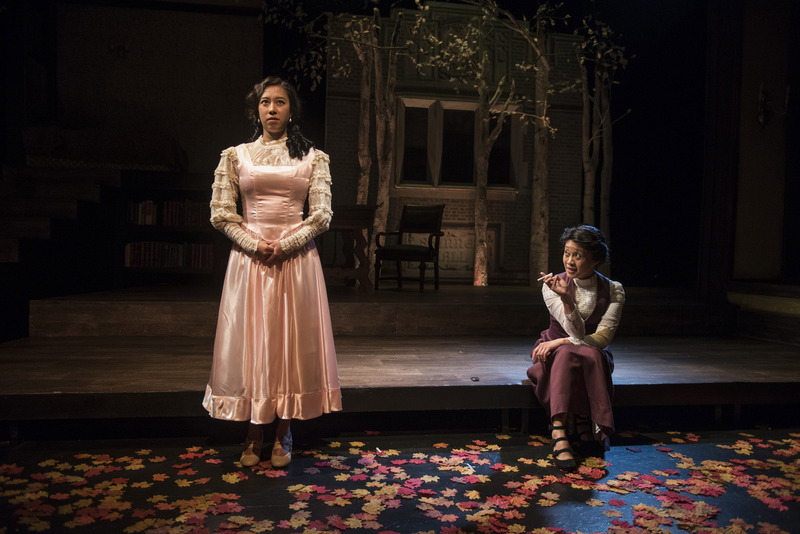 Emjoy Gavino and Kelli Simpkins/Photo: Michael Brosilow. So often, when iconic LGBTQIA characters appear in our cultural narratives, they don’t get the same freedom to be messy and flawed as heterosexual characters would in the same circumstance. About Face Theatre’s “Bull in a China Shop” inches into what little theatrical space is made for queer relationships working through dysfunction, and works to widen the playing space for normalized, un-precious portrayals. Author Bryna Turner and director Keira Fromm have wisely ignored the pristine women collecting dust in hardbound volumes; instead, they pry up the floorboards for the more profane, unkempt, and well-lived stories we never see. In 1900, Mary Woolley (Kelli Simpkins) warns that, in making her the president, her appointees at Mount Holyoke women’s college will be getting someone obstinate, who openly dismisses the institution’s objective of producing marriageable women. Instead, she and Jeannette Marks (Emjoy Gavino), a professor and Woolley’s lover, work to cultivate Mount Holyoke into a gay utopia of feminist free-thinkers and activists. This comes to the chagrin of Dean Welsh (Mary Beth Fisher) and countless donors, who don’t want to take sides on women’s suffrage or war. But soon, decisions on when to compromise and when to stick to their feminist principles put a rift between the president and professors like Marks and Felicity (Adithi Chandrashekar) and students like Pearl (Aurora Adachi-Winter). It’s one thing to state your politics, it’s quite another to live them. Aurora Adachi-Winter and Emjoy Gavino/Photo: Michael Brosilow. One method author Bryna Turner uses to remove the dust jacket from her historical characters, is by giving them hyper-modern language; that is, lots of swearing, jokes, and even some nods to meme-culture and fandom. (When referring to Marks and Wooley, student Pearl gleefully announces, “We ship you!”) This cast is not only phenomenal in their roles, their representation onstage tells a visual story about how white feminism fails, and how women of color are left to do the heavy lifting. At the helm of Mount Holyoke is Kelli Simpkins, who is such a positive force as Mary Woolley, she can talk her way out of any setback. There’s something very grandfatherly in her insistence on having your trust and devotion, but then squandering it a little at a time. Equally as fun to watch spiral into chaos is Emjoy Gavino as Jeannette Marks, who is well past folding under the weight of a career, students, and conventional wifedom she never asked for. Aurora Adachi-Winter is a harbinger of trouble-to-come as Pearl, a feisty student powder keg guaranteed to explode in a mess of angst, feelings, and pink satin. Adithi Chandrashekar is an endearingly awkward ladle of sugar as Felicity, and Mary Beth Fisher is a syringe of droll acid as Dean Welsh. 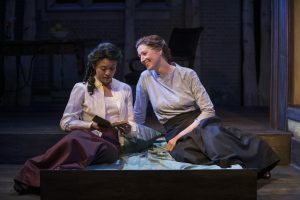 This production is the sort of theatrical medicine needed to combat Chicago’s continued love affair with straight white male playwrights and directors, and will have you longing for an autumn campus library, even in the midst of a sunny Pride month. Consider it required viewing if theater by women of color is important to you. TEN WORD SUMMARY: A love story. A profane, bustle-skirted, academic love story.